Though I've been on a pumpkin binge, I broke with my current obsession yesterday to try out something new for breakfast. And I'm soooo glad I did! Serious yummage! It's October, so the stores are full of fresh apple cider - which got me thinking... hmmmm, what if I use apple-cider instead of .... and away to the kitchen I went. I've got some fabulous recipes coming soon with apple-cider as the star ingredient. But back to yesterday... I swapped out my beloved pumpkin for applesauce (1/4 cup, unsweetened) and used apple cider instead of water to mix my oatmeal & protein powder. A dash of cinnamon, a dash of nutmeg, a tablespoon of NuttZo (if you haven't tried this yet, you should!) and a new breakfast bowl was born. But I knew I could do better. :-) This morning, I proved it. Here you go - another oatmeal recipe that proves oatmeal is NOT boring! 1 small-medium apple (any kind, I used gala), cored and diced - skin on. In a bowl, mix together the oatmeal, protein powder and 1 tsp (or less to your liking) cinnamon. In a glass bowl, combine the apple chunks with more cinnamon and nutmeg (I used about 1/2 tsp cinnamon and 3 shakes of the nutmeg bottle), 1 tsp vanilla and a splash (1-2 Tbsp) apple cider. Cover and microwave for 1-2 minutes, until the apples are soft and the liquid is syrupy. Stir. 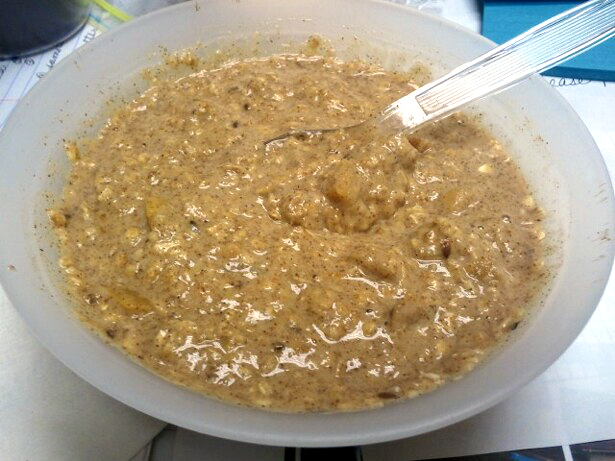 Add the apple mixture to the oatmeal, add apple cider and stir until you get the consistency you like. Stir in NuttZo or nut butter. Do you like NutZo? I saw this on Dr. Oz last week. Absolutely!! They actually ran a special sale just for us a couple weeks ago - gave us 25% off! It was awesome!! :-) They're a fabulous company with a super-tasty product! Great! I am going to have to try it.